Not quite the jobs bump. 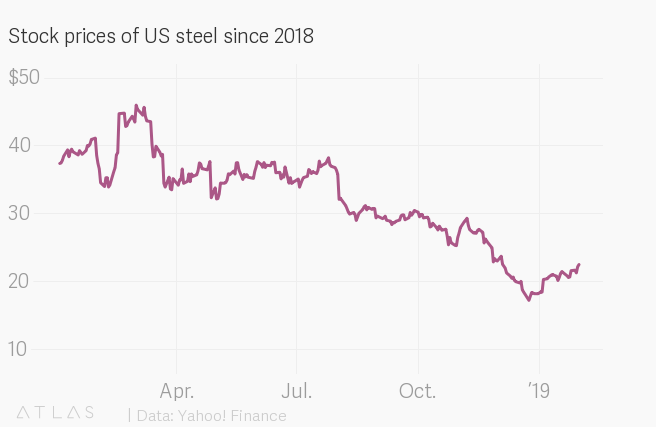 US Steel’s earnings are way up year-over-year, and tariffs on foreign steel appear to be the largest factor explaining why. The company’s $592 million of net income in the fourth quarter was a nearly four-fold increase from the same time last year and exceeded the $387 million it earned (pdf) in all of 2017. But protectionist policies from the Trump White House weren’t enough to protect US Steel shares from disappointment on Wall Street. With fourth-quarter revenue at $3.69 billion, shy of an expected $3.75 billion, the company’s shares opened 7.6% lower after the results were released on Jan. 30, and the stock has continued to fall. At $21.87, the shares are now down 40% over the past 12 months, which points to a broader malaise hanging over the sector. Trump has made US Steel, and the wider manufacturing industry, a focus area both as president and political candidate, with his campaign promising to get tough on China and bring back manufacturing jobs. Rust-belt states like Pennsylvania, where US Steel is headquartered, are traditional manufacturing heartlands that helped propel him into the White House. Without tariffs, the US steel industry remains uncompetitive on price with much of the world. China leads the way—its output first matched that of the US in 1993, and is now more than 10 times the size. This has driven prices down over the years, and slower economic growth in China now isn’t helping. Trump’s 25% tariff on steel, announced last March, has given domestic manufacturers a bump. Though even that hasn’t translated into much gain for workers.